April fifth, brings a crisis regarding riots and protests in nations involved in the South China Sea debates, delegates in the United Nations Security Council (UNSC) move to discuss. Delegates debate the importance of human rights, the UNSC decides to head into moderated debate to address the topics of this crisis update. With the crisis update, the members of the UNSC learned of riots against China’s actions in the South China sea start up in the Philippines and Viet Nam. 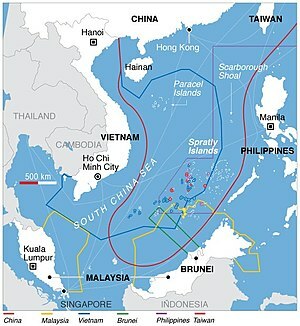 Theses states claims of China's aggression has lead of the damage of many private properties and brings the resolution of disputes in the South China Sea farther from a close. They also learned of violent protests starting up at a gay pride parade against the government in Brunei. In escalation anti-government participants burned down the capitol building with kerosene. With these event Brunei pulled back on some of their naval presence on two unnamed islands they have control over south of the Allison Reef. During the moderated debate the delegate from China expressed that they “[don’t] support the riots” taking place in both Viet Nam and the Philippines. Furthermore the delegate from China expressed their “condolences” to Brunei and the burning of their capital. They ended their statement by declaring Brunei would benefit from joining the one belt one road initiative. This last statement was immediately met with opposition by the delegation from France claiming it was a “bilateral agreement” and something to be discussed by the UNSC. As for the rest of the states, there was a cross between those thinking recent events should be focused on and those who thought that going back to the directives they had before them was of top priority. Those states in the former position were the delegations from the United States and Russia. The United States was hopeful to take “joint action” and pass two directives they were familiar with in order to have maximum impact. Those states who were wishing to focus on the crisis further were the delegations from Belgium, Equatorial Guinea, Indonesia and Kuwait. However there was more than one spin taken away from this. Belgium, Equatorial Guinea’s delegates believed that the “violent behavior” in Brunei is necessary to “mitigate”, and although sovereignty needs to be protected, as the UNSC it’s their “job” to make sure this action isn’t taken without recognition of wrongdoing. The delegate of Indonesia also chimed in that the “UNSC has an obligation to address the human rights violations” that have been committed in Brunei. Kuwait was concerned more with the “pull back of Brunei’s naval presence”, and making sure “no other military advancement” would take place in the region. France however was concerned that other states were acting “rashly” and that there should be no” retaliation against [governments]”, but they should be concerned with damages that resulted from the riots and from the protests in Brunei.